Social Media has greatly facilitated direct communication and engagement with current as well as prospective customers. This helps in the process of brand awareness and also, improves customer relations. Ginger Domain can help you in establishing your brand on major social media platforms. Our social media marketing services help you to devise an effective strategy to promote your brand in a positive way. Social Media Marketing is an important part of digital marketing, enabling you to interact directly with your customers as well as target audience. Our Social Media Marketing services helps you in increasing your brand reach through multiple channels of social media. You can monitor and analyze the feedback of your customers, which will help you to market your products and services more effectively. We use advance social media marketing tools to ensure best results for your brand. Also, we can easily integrate the latest social networks as soon as they go live or become available. So, you can easily communicate with your new and existing customers through various social media channels. Also, we help you in monitoring their responses about your brand, competitor’s brand and overall sentiments relevant to you. The technical experts of our team can help you to measure the effectiveness of each post that is included in the campaign. We provide thorough research findings and data analysis for reference. Following the current market trends will help in growing your business. We help you in creating and distributing content on multiple social media such as Facebook, Twitter, LinkedIn, Pinterest, etc. simultaneously. This ensures uniformity across all social media channels and the content covers maximum target audience. Using our advanced social media tools, we can schedule your posts according to your preference. The importance of monitoring brand’s performance has already been established. It is vital to pay attention to the conversations of the customers so as to analyze their sentiments. We can keep a track of the positive and negative reviews whilst managing the social media properties across all networks. 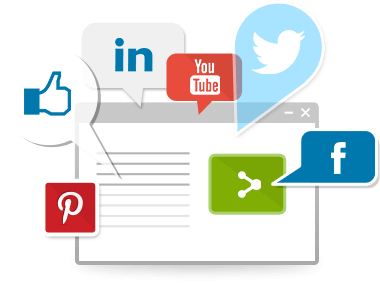 We can provide you quick yet detailed reports of your social media marketing campaign by measuring the success metrics. Also, you can track down social media profiles, content messages and mentionable sources of your brands over a specific period of time. With the help of various social media platform, you can directly communicate with the potential customers. You can find new or prospective customers via Social Media Marketing to keep your business growing and for the development of your brand.